It began with a phone call on Dec 8, 1989, and an idea to discuss operational issues as part of a clinical improvement project. Almost two months later, 29 people held a face to face meeting in Newark, NJ at the Roche CPU “Lilly Round Table”. The first informal gathering of CPU folks was hosted by Susana deDennis/Roche CPU (Beth Israel Hospital) in Newark, NJ in 1989. The first meeting at Roche hosted by Dr. deDennis was so productive that they agreed to meet later that year at the Wyeth CPU in Philadelphia, PA hosted by Dr. Piergies. It was at this second gathering on Sept 11, 1990 with 69 attendees, that Susana deDennis, Toni Piergies, Mary Unruh, and Gary Steinman discussed the possibility of establishing a professional society for people who worked in either academic or “in-house” CPUs. The group elected the founding executive board and charged the board with organizing the Association fo Clinical Pharmacology Unites, or ACPU. Jack Luderer of the Upjohn CPU (Jasper Clinic) hosted the first official meeting of ACPU in Kalamazoo, MI in 1991 with about 90 people attending. The Bylaws were adopted on October 15, 1991, and the first slate of officers and Directors were elected: Susana deDennis, President; Tony Piergies, President-elect; Gary Steinman, Treasurer; Mary Unruh, Secretary. There was a lot of energy those early years. Pharma was profitable and staffs were energized. 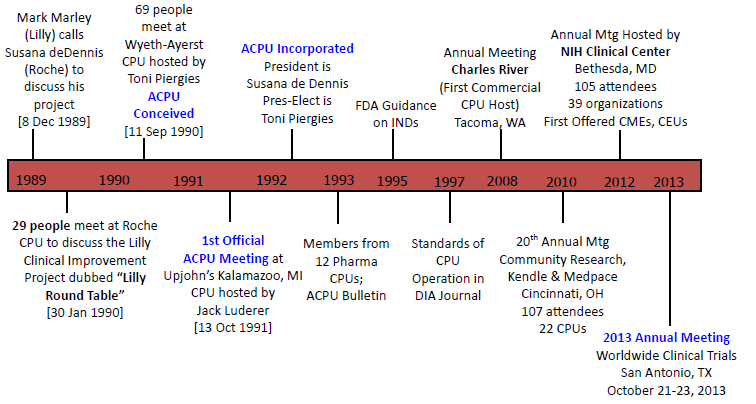 An ACPU Bulletin started in 1993, committees were formed, contributions to the new FDA guidance on INDs were made, and a “Standards” document that was presented and later published in DIA Journal was produced. The middle years were a bit more difficult as Pharma stumbled, re-structured and cut back. The industry experienced broad, sweeping changes with lots of mergers, re-organizations, and CPU closings. CROs were allowed to join ACPU in a by-laws amendment in 2006, and a new ACPU was forming. Today we have 22 CPUs represented by 107 attendees from 54 organizations.